Welcome to Coffey Medical’s new FAQ, your one-stop page for answering your questions and concerns about our Philips Holter systems! We’ve addressed the most common queries – from questions about where to place the leads to information about how save the data, and much more – our FAQs have you covered! Don’t see your question answered below? Feel free to shoot us an email at sales@coffeymedical.com and we will respond as soon as we can. What is the Zymed Lead Placement? Zymed utilizes 5 electrodes in the EASI configuration. One electrode acts as the dynamic ground. The EASI hook up allows the Zymed Holter algorithm to utilize vector cardiography to create highly accurate derived 12-leads on every beat throughout a Holter scan. How does Zymed create 12-lead data while only using 5 electrodes? Captures a 12-lead ECG from just 5 electrodes using EASI hook-up. Full disclosure on all 12 leads for 24, 48, 96 hour or 7-day studies with no data compression (shows every beat) and can override and recall for each of 4 scanning modes. What makes the DigiTrak XT Monitor so great? The DigiTrak XT digital Holter monitor is the size of an AT&T pager, runs on a single AAA battery and can tolerate complete water submersion (survives 15 seconds in 2 feet of water, the depth of a bathtub). The DigiTrak XT Monitor’s LCD screen allows you to check the quality of the electrode connection on all 3 leads without connecting to a cardiograph or other device. Every DigiTrak XT Monitor has adjustable pacemaker detection included as well. What is the difference between a DigiTrak XT and a DigiTrak Plus Monitor? 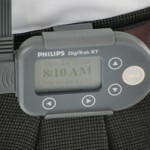 Philips no longer manufactures the DigiTrak Plus Monitor. Philips stopped supporting the DigiTrak Plus recorder on 12/31/2014. These old Plus monitors were not capable of working with the newer 64-bit computers. If you already have DigiTrak Plus Monitors and would like to purchase more monitors, you can run both DigiTrak Plus and the newest DigiTrak XT monitors on the same Zymed Software if you still have a 32-bit computer. Philips developed a Dual Dock Docking Station that will allow you to download studies from both types of monitors using the same docking station or cradle. The part number is #989803157511. Digitrak XT monitors are available in 24, 48, 96 and 7 day configurations. Check out this page for more information on the DigiTrak XT Holter Monitor. What are some other unique features of the DigiTrak XT Monitor? The DigiTrak XT Monitor automatically tests the power of a battery when you insert it to make sure it will last the entire length of time you would like the patient to wear it. Upon battery insertion, it also tests the Monitor software and sealed memory to make sure they are operating correctly. If you forget to start the DigiTrak XT Monitor before sending the patient home, it will automatically turn itself on and start recording if it detects a heartbeat for longer than 30 minutes. Why do you have 3 lengths of patient cables, and what makes them so great? We offer three lengths of patient cables because patients come in different sizes. All DigiTrak monitor cables are shielded with Kevlar which makes them very durable. They are bonded together for most of the length of the cable to help eliminate artifact. The recorders we use cost a lot to repair. How much does it cost to repair a DigiTrak XT Monitor? The DigiTrak XT Monitor has no moving parts and comes with a two-year warranty. After the second year, a service contract is only $19.15 per month. As a matter of fact, we could even sell you a recorder with as many years of coverage you desire built into the purchase price or lease. However, many customers decide it is not necessary to purchase an extended Service Agreement. Average repairs for DigiTrak XT Monitors after the two year warranty runs less than $400. The flashcards our holter recorders use are expensive and wear out. How does Zymed deal with this? The DigiTrak XT has non-removable memory and is available in four versions that stores up to 7 days of data without data compression. As a non-removable memory, the flashcard is never lost or stolen; you will never have to replace it. Other companies tell me that they sample at 1,000 times per second, while you are only 175 times per second. Why is that? The international, AAMI standard for Holter is 128 samples per second. At 175 samples per second, we are 35% above the AAMI standard. We do not compress the data. This means that all the ECG is stored without compression and then analyzed by the software so that you can be sure that nothing is being missed. Another way to think about this is that 175 samples per second is the same as trying to draw 175 small dots on graph paper in 1 second. Obviously, there is no need to have more samples per second. Is there a way to eliminate the need for an EKG Cart or other device every time we hook up a holter patient? With the three-channel preview screen on the DigiTrak XT Recorder, you can verify your hook-up without the need for an EKG cart. What scanning tools does Zymed deliver that will make my life easier? I completed this holter report – now what can I do with it? After completing a Holter Report, the Philips Holter system has many exporting capabilities to help your desired workflow. Included with Zymed software is ZPT Report Viewer. ZPT Report Viewer can be loaded on any PC in your network to open and edit Holter reports. You can also export or email Holter reports as encrypted vector .PDF files, or send Report Results as an HL7 message or PDF file to your Electronic Medical Record System. Finally, you can send Holter reports to ECG Management solutions such as Philips Intellispace ECG, Epiphany Cardio Server or any other management system that can accept a PDF file. How would we get trained on the new Philips holter software? Your purchase price for the Philips Holter Software includes two days of on-site training. The two days of training you receive is provided by Philips’ applications staff. All service and warranty issues are handled directly with Philips Medical with Coffey Medical’s oversight to make sure our great customers are being taken care of promptly and professionally. Philips Customer Support for Zymed Holter can be reached at (800) 722-9377 ext 3 Option 1. All service and warranty issues are handled directly with Philips Medical with Coffey Medical’s oversight to make sure our great customers are being taken care of promptly and professionally. Philips Customer Support for Zymed Holter can be reached at (800) 722-9377 ext 3 Option 1. Zymed DigiTrak XT Monitors have a 2 year warranty. Zymed software has a 90 day warranty that starts after installation and onsite training. A Service Agreement does not need to be purchased to handle software related questions. How does the Zymed algorithm deal with artifact? The best way to deal with artifact is to make sure you are getting a quality hook up to the patient. This means careful skin preparation prior to applying a high quality snap electrode. Zymed Holter software has numerous tools to help you deal with artifact. You can increase or decrease the gain on all 3 channels independently. You can also adjust the sensitivity of the system under Rules. Finally, you can turn off Analysis on any channel if it becomes too big of a problem. Finally, our new CALL Button helps you to deal with artifact as well. After I scan data into our holter system, I can only save the report. The raw holter data is lost. Is that true with the Philips Holter system? Zymed stores both the raw data and the finished report so you can go back and re-analyze the data with different settings at any time. Our existing system does not let us store the studies and reports digitally. Does the Philips Holter system allow us to store our studies and reports digitally? Zymed’s .zpt Report Viewer software allows you to store and transmit the Holter studies digitally. Reports can also be stored and transmitted as an encrypted .pdf file, or sent as an HL7 message . You can even email encrypted reports right from the Philips Holter software. If our current holter system goes down, we are at a standstill until a service technician arrives. Last time it took 3 days to ger our system going again. How is Zymed different? As a software-only solution, you can re-load the Zymed Holter software on another Pentium computer and start scanning again in minutes. Should you decide to upgrade for better computer performance in the future, you can do so at any time by reloading the software. Some competitors offer you a “free” computer with the purchase of their system. The real cost of that “free” computer shows up in high yearly service contracts or service calls billed at time and materials after the one-year warranty expires. My technicians would like to work from home sometimes. Can they still help my office team? By being a software-only system you can load the Zymed Zybit Central Site software on their home computer, and e-mail the reports back and forth. Can we increase the turnaround time to our satellite locations? With the patented Zybit Remote Link , we can turn reports to a satellite location within just a couple of minutes from sending the study. I am concerned our existing software is missing things; so I end up having to look at every beat. This can take hours. How can Zymed help? We provide 4 different scanning modes including our unique QuickScan mode. It provides the best of retrospective and prospective scanning. You can analyze the easy exams with retrospective (automatically) and analyze the more difficult exams with paging, superimposition, or QuickScan (interactively). Atrial Fibrillation is a huge headache for us on our existing holter system. How do you deal with it? We have accurately analyzed atrial fibrillation for 20 years. Our atrial fibrillation algorithm automatically quantifies atrial fibrillation episodes, giving your physicians hourly totals of QRS’ and minutes in atrial fibrillation and a calculation of the percent amount of time in Atrial Fibrillation. Our new Call Button feature is a fast way to deal with intermittent Atrial Fibrillation without changing Rules Sets. We have two separate controls under Rules adjust the number of beats analyzed and the heart rate variability to help dial in and correctly call Atrial Fibrillation. The high heart rates on pediatric exams are not recognized by our existing holter system. Can Zymed handle Pediatric cases? We analyze pediatric heart rates up to 300 beats per minute. Most Holter systems cannot detect rates over 220 beats per minute. Additionally, the small size of the DigiTrak Monitor makes it ideal for pediatric studies. I wish that I could select what 3 leads I want to use for scanning and printing to quantify disease in different parts of the heart? With Zymed, you can simply select any 3 leads from the 12 leads that you want to use for scanning. The benefit of that is that you can verify or diagnose different disease states within the heart such as an anterior MI or a lateral MI. Our Zymed algorithm is the only Holter system that can accomplish this. Sometimes the amplitude of the EKG waveform is so high that it is off the screen and is being miscalled in our current holter system. How does Zymed deal with this? With Zymed, you can adjust the gain in each channel independently so amplitude is not a problem. This will also help the Zymed algorithm correctly call beats. Our system is missing atrial fibrillation. How does Zymed deal with this? You can adjust the atrial fibrillation sensitivity so that the system will not miss any runs of atrial fibrillation by adjusting R-R interval variability. Sometimes when reviewing full disclosure, I do not remember seeing a beat during scanning. How can I find it? From the full disclosure documentation in our report, you can simply click on the beat in and view it in real time and in all 12 leads. What if I see something in the report that I do not remember or do not want to be there? The Zymed Holter Software allows you to click on a section of the report and pull up the beat in and look at it in all 12 leads to verify or edit. Editing from the Zymed report is an excellent productivity enhancement. We refer to this capability as Hyper Linking. Sometimes I cannot tell from only 3 leads whether a shape is ventricular or aberrantly conducted supra ventricular in origin. How can Zymed help? Using the calculus of vector cardiography in our EASI hook-up configuration, we generate 12-lead EKG’s on any wide complex shape or rhythm. You can accomplish this on any beat. Pacemakers are a huge headache for my staff in our existing Holter system. How does Zymed handle pacemakers? Our DigiTrak XT Monitor s include an adjustable pacemaker sensitivity that allows you to attenuate the high pacing artifact on unipolar pacemakers and augment the low pacing artifact on bipolar pacemakers. I am confident with only 3-leads of ST analysis that I am missing ST episodes. Can you help me? Yes. Again, using the calculus of vector cardiography in our EASI hook-up, we perform ST analysis on all 12 leads. A 12-lead ST analysis identifies ischemic changes in all 3 major coronary vessels. How can I assure myself that I will not miss any paced beats? With the DigiTrak XT Monitor you can adjust the pacemaker sensitivity threshold from 1 to 16 millivolts. WE ARE THE ONLY COMPANY THAT OFFERS THIS FEATURE. Why should I purchase from Coffey Medical? If you read our About segment of this website, you will learn that Coffey Medical specializes in selling Philips Zymed Holter. We are their Master Distributor in the out of hospital market, and cover all sales for hospitals for Philips. We have hundreds of customers that rely on our expertise to help them grow their practice or department using Holter. Philips Zymed Holter system is one of the leading Holter systems for sale in the world. It is designed for hospitals, cardiologist and large multi-specialty groups that are looking for a superior Holter scanning solution. Hospital Purchase Orders are made out to Philips. Training is handled by Philips employees, and Technical Support is handled out of Atlanta, GA by Philips employees. Who uses Philips Zymed Holter? Scanning service providers also known as IDTF’s or Independent Diagnostic Testing Facilities. These organizations appreciate the accuracy of the Zymed Holter Algorithm, the easy to use Scanning Tools that increase scanning speed, the ability to import studies from multiple locations, and the ability to output reports as a vector PDF file, HL7 message or in the editable .ZPT Report Viewer format. Why are you guys so much more expensive? We are the highest quality Holter scanning system on the market. What we have found is that some doctors want features such as 12-lead selectability, ST segment analysis, different scanning styles (both automatic and interactive), atrial fibrillation scanning tools, and the physical capabilities of our system related to the recorders and their ease of use. Other doctors just want to do a fast, cheap, down and dirty study. We offer a basic retrospective version of the Zymed Holter system that will more than match the limited features of less expensive systems. After doctors see all of the other capabilities we offer they often choose the more capable version or choose the basic system knowing that they have an upgrade path for the future. Check out our Blog and you will learn that there are two costs to doing Holter. The acquisition cost of the system is the least important. Can I purchase the system directly from Philips and save money? Philips uses Coffey Medical as their exclusive representatives for all hospital sales. These orders are placed directly with Philips. We are the Master Distributor for selling into physician offices and clinics. For out of hospital customers, we sell direct at substantial discounts off list price. We have many satisfied customers around the country, and are happy to provide references to you. What makes Philips Holter a better long-term investment over other companies holter systems? When you purchase a new Philips Holter system, you can rest assured that your system will never become obsolete. The Philips Holter system is sold with a USB Hardlock key that acts as a seat license. About every 12 months, Philips releases a new software revision that can be purchased for under $500 that updates your Holter software with the latest features. All new software upgrades are always backward compatible so that you never end up with obsolete recorders. Each doctor wants a different style of report. Can you help me? The Philips Zymed Holter software allows you to customize reports. You can select from 7 different cover styles and different report sections per physician request. They can modify the word choice in the Narrative section. They can set up different protocols for strip documentation per physician. I have multiple locations. Can the Philips Holter system help me? Our largest customer handles over 100,000 holter studies a year using our Zybit Remote Link software. For years, the largest IDTF’s or Scanning Services in the country have relied on Zymed’s Zybit Remote Link capabilities to provide Holter Scanning to their customers. Some of these IDTF’s have hundreds of remote sites sending thousands of Holter studies a month in to be scanned. Zybit Remote Link can be installed on any Intel Chip PC in your office with a docking station to send Holter data quickly to your Central Site for scanning. Studies can even be scheduled to send at night. Completed Reports can also be sent back over the same Remote Link Connection or other methods can be used that are outlined below. My physicians would like to review holter final reports in their offices on their computers. Can your system help me do this? Each Philips Holter purchase comes with an enterprise license of .zpt Report Viewer software to read and edit final reports from any networked computer. These reports may be sent to your physicians via encrypted e-mail or archived on the network for your physicians to retrieve. 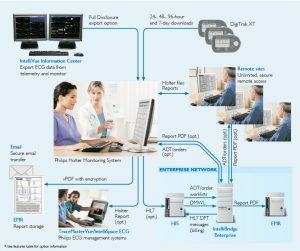 We can also export the final Holter Report as an HL7 message or PDF file into an ECG Management system like Philips Intellispace ECG, Epiphany Cardio Server or any other management system that can accept a PDF file. Is there a way to download Orders from our Electronic Health Records System or EMR into Philips Holter? Using Software Rev 3.0 and Philips Intellibridge Enterprise you can download Orders into the Philips Holter system at either the main scanning site or at a Remote Site. The patient demographics can even be downloaded into the DigiTrak XT Holter Recorder.